An initiative by Galileo and Junaio has enabled TV viewers to actively participate in a live television show and react to things shown on the TV screen, by simply using a smartphone and the augmented reality browser junaio. 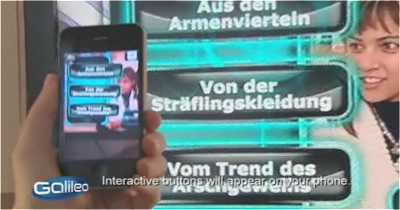 A live broadcast of the popular German science show ProSieben "Galileo" featured a quiz where viewers could point their smartphone's camera at the TV screen and participate directly. 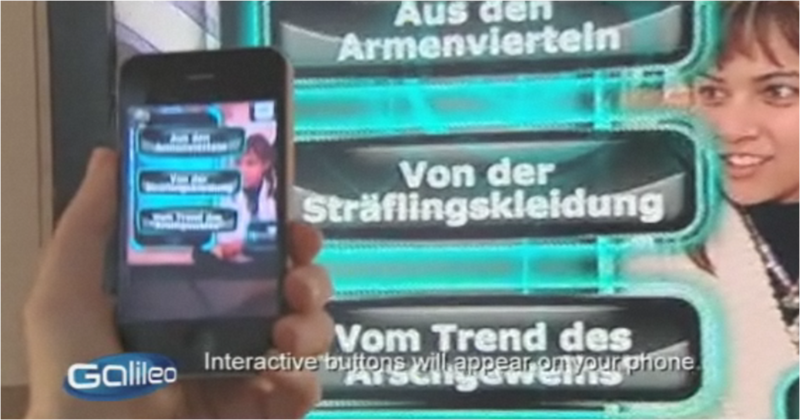 Multiple choice questions were displayed simultaneously on the TV screen and the viewers mobile (through the AR browser.) The mobile user could then click on one of the answer options and get instant feedback on whether they were right or wrong (regardless of whether the answer had appeared on the TV by that point.) Mobile players could also see how they ranked compared to other people playing at home. Click to see video of the Galileo Junaio TV quiz app in action! Great idea. It signifies that in the future T.V. will be more interactive, in order to engage the viewer.